The eerie megaliths of Stonehenge have inspired speculation for centuries. 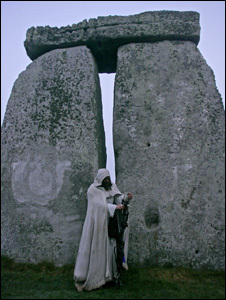 Druids—and sometimes aliens—have been suspected of planting the 4,500-year-old stones. Is Stonehenge an astronomical calendar or a place of healing or a marker for magical energy lines in the ground? For a long time, no one really knew, though some theories were more grounded in reality than others. 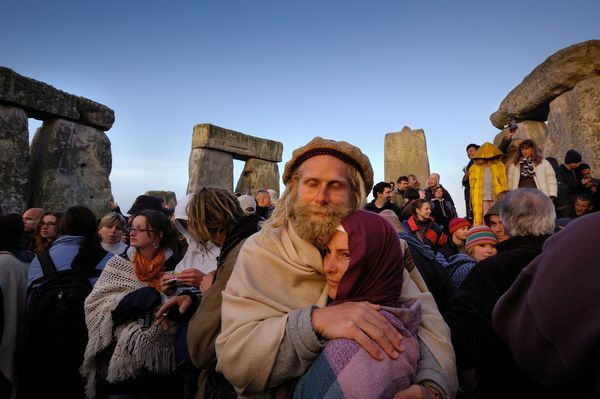 Each year revelers like these travel to Stonehenge to celebrate the summer solstice. But now, we may be a little bit closer to understanding the monumental Neolithic site. Archaeologist Mike Parker Pearson and his colleagues at the Stonehenge Riverside Project, whose research was funded in part by the National Geographic Society, spent seven years excavating Stonehenge and its surroundings. This month, Parker Pearson published the project’s findings in a new book, Stonehenge—A New Understanding: Solving the Mysteries of the Greatest Stone Age Monument. National Geographic writer Rachel Hartigan Shea spoke with Parker Pearson about what he and his colleagues discovered and how modern celebrants greeting the summer solstice at Stonehenge may have gotten the wrong day. What got you first interested in researching Stonehenge? But I realized that actually we did have timber circles very close to the stone circle of Stonehenge. That was quite a bombshell for me. How were the excavations that you worked on at Stonehenge different from previous excavations there? When we came back to Stonehenge and dug there, we recovered some 60 cremation burials inside Stonehenge. What we now know is that Stonehenge was the largest cemetery of its day. Ramilisonina’s ideas about a place in stone for the dead and a place in wood for the living started as a theory but has actually become a fact as a result of our investigations. The timber circles were located at a site called Durrington Walls. How was that the place of the living? At Durrington Walls, we have two of these great timber circles—a bit like Stonehenge in wood—at the center of an enormous village. From where we’ve excavated, you’re looking at a fairly dense settlement of houses. We also know that there were seasonal influxes into the settlement at Durrington Walls. Through analysis of the age patterns on the teeth of pigs, we can see that there are particularly high points in the slaughtering patterns. The pigs had given birth in spring, and what we’re seeing is a culling in the middle of the winter. Here we are on the summer solstice, but this evidence suggests that people were gathering in large numbers at the winter solstice. We’ve been getting it wrong in modern times about when to gather at Stonehenge. So Stonehenge was built to commemorate the dead? Stonehenge wasn’t built in order to do something, in the same way you might build a Greek temple to use it for worship. It seems much more likely that everything was in the act of building—that you’d construct it, then you’d go away. You’d come back 500 years later, you’d rebuild it in a new format, and then you’d go away. I think we have to shake off this idea of various sorts of priests or shamans coming in every year over centuries to do their thing. This is a very different attitude to religious belief. It’s much more about the moment. It’s about what must have been these upwellings of religious—almost millennial—belief, and once the thing is done, then everyone disperses and goes back to their lives. What do the summer and midwinter solstices have to do with where Stonehenge is located? One of our discoveries in 2008 was on the avenue that leads out of Stonehenge. As you are moving along the avenue away from Stonehenge, you are looking toward where the sun rises on the midsummer solstice. If you turn 180 degrees and look back toward Stonehenge, that’s where the sun sets on the midwinter solstice. Underneath the avenue, we discovered a natural landform, formed in a previous ice age, where there are grooves and ridges that by sheer coincidence are aligned on that solstitial axis. Right next to this landform are pits dug to hold posts that were put up 10,000 years ago, much older than Stonehenge. Another archaeological team has discovered down by the river next to Stonehenge a huge settlement area for hunters and gatherers, which seems to have been occupied on and off for something like 4,000 years before Stonehenge itself was ever built. We think that long before Stonehenge this location was already a special place. These hunters and gatherers may have been the people who first recognized this special feature in the land where the earth and the heavens were basically in harmony. Follow Rachel Hartigan Shea on Twitter. Stonehenge gathering marks summer solstice. They came in their thousands. Some worshipped, others partied. Many were there simply to enjoy the atmosphere of the summer solstice at Stonehenge. More than 20,000 people were at the ancient monument to greet the sunrise at 4.52am at the start of the longest day of the year. After a warm, moonlit night the mist and mizzle descended, making it impossible to judge the moment when the sun rose over the Wiltshire plain without an accurate watch. As the sun ascended, invisibly, he called for peace in the east, west, north and south. “That’s what it’s all about, we want peace and fairness for all,” he said. It was a busy time for the king. Overnight he had also carried out around a dozen “handfasting” ceremonies – the pagan equivalent of weddings. Husband and wife vow that they will stay together “for a year and a day, eternity and beyond or for however long love will last”. The 21st century is proving a good time to be a druid or pagan. Almost 60,000 people in England and Wales described themselves as pagan in the 2011 census. Steve Harris, 20, from Manchester, had different priorities. “I’ve lost my mates,” he said. He admitted to having drunk an evil-sounding mixture of lager, cider and brandy as well as having smoked “something a bit herbal”. Harris said he intended to stay “pretty sozzled” between now and next week when he would be at Glastonbury. The solstice at Stonehenge used to be a staging post for many hippy types heading to the music festival but Glastonbury and Stonehenge have changed over the years. 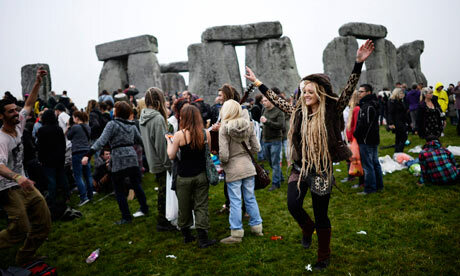 Gone are the ugly clashes between revellers and police that resulted in the stones being closed at solstice. By this time next year major changes at Stonehenge will be complete. On Monday, one of the roads that runs close to the stones will be closed and by this time next year it should be grassed over as part of a project to restore one of the key approaches to the site. A new visitor centre is to be opened in December.